The Fujifilm GFX 50R offers one of the most affordable routes into medium format shooting. The GFX system also adds a level of "ease of use" that makes it easy and straightforward for anyone who is used to Fujifilm X series cameras to simply pick up the camera and start shooting. If you're looking for the next step up in image quality, and want an extra edge, and you've reached the limits of what you're currently shooting with, then the Fujifilm GFX 50R system can deliver exceptional image quality. For this reason, it's Highly Recommended. 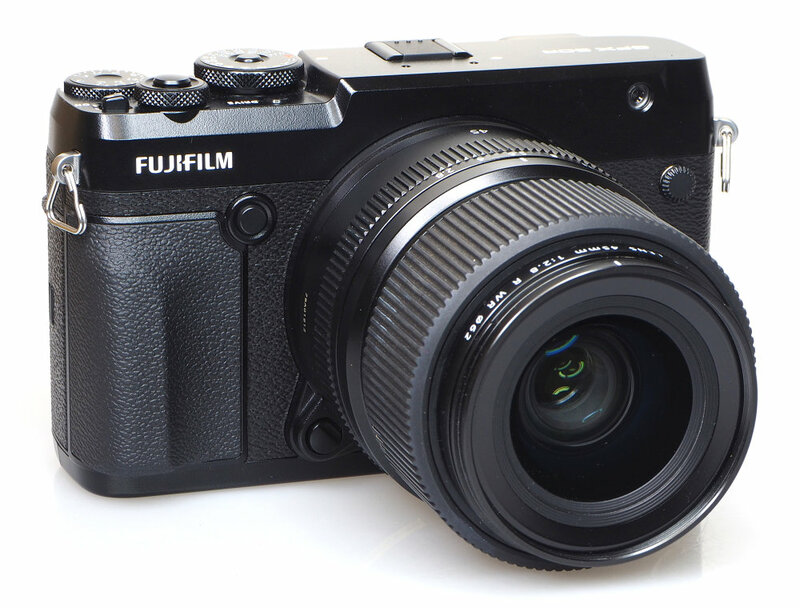 The Fujifilm GFX 50R is a more compact version of the GFX 50S, with the same 50mp medium format sensor, a built-in electronic viewfinder, and a more affordable price tag, of £3999 body only, making the GFX 50R the most affordable "medium format" digital camera available. The medium format sensor offers larger pixels than most smaller sensors, with pixels that are 5.3 microns in size, which should mean better dynamic range, as well as better low light performance (than a sensor with smaller pixels). The sensor does not feature an anti-aliasing filter, which means that the sensor will deliver the sharpest possible images, with the potential risk of moire. Fujifilm GFX-50R Vs 50S - How do they compare? 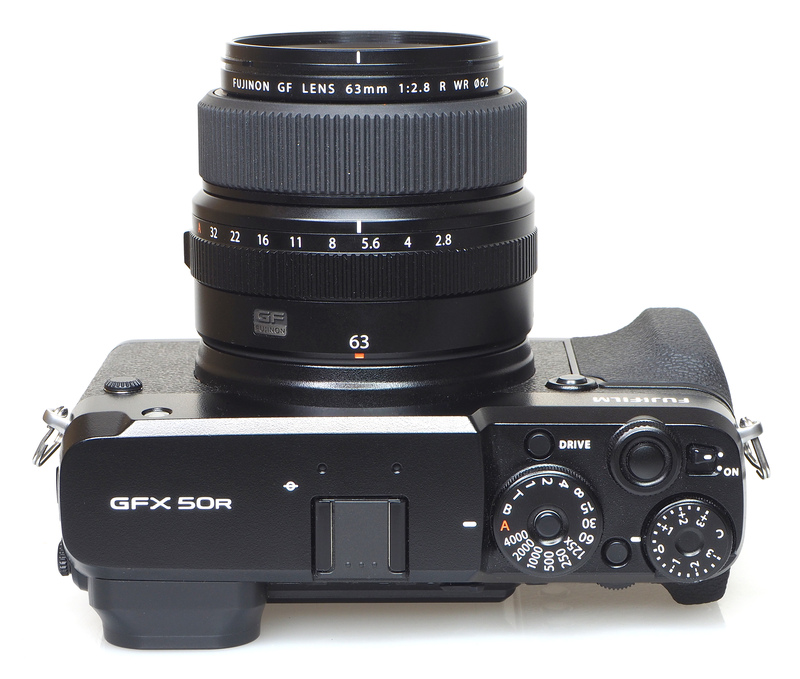 Despite the GFX-50R being a smaller camera, it's still a large camera. Despite the GFX-50R being a smaller camera, it's still a large camera, and until you see the camera in person you may not be aware of how large the camera is. You also have the fact that a larger sensor, needs larger lenses. 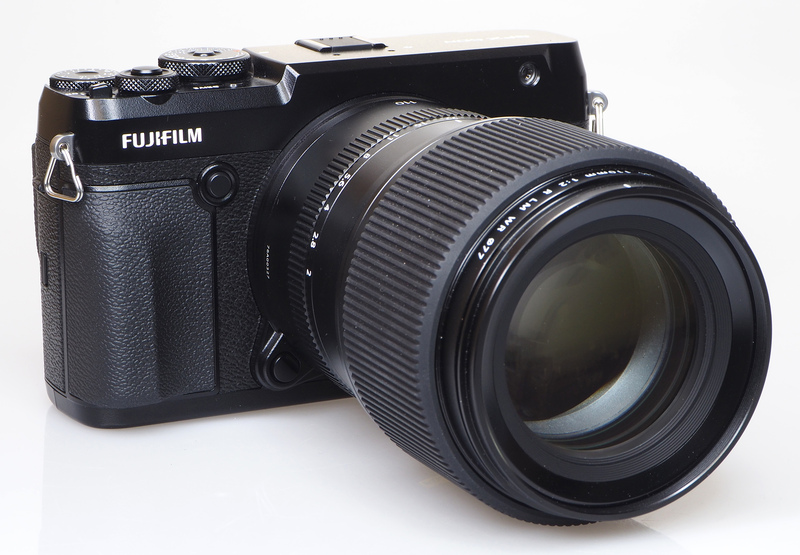 So there is a range of lenses available for the camera, and for the most part, Fujifilm has produced a number of fairly compact (for medium format) lenses. There are also a number of large lenses, as you would expect when dealing with a medium format system. 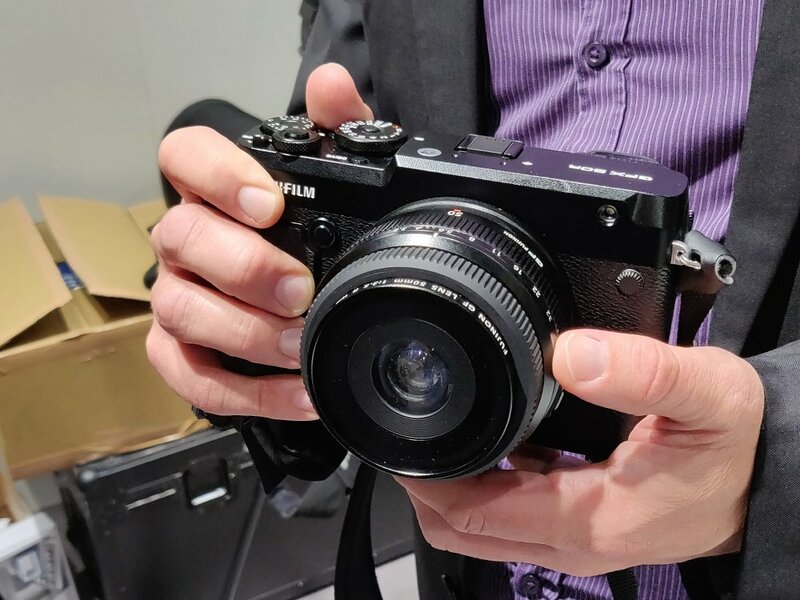 Here's a photo of the Fujifilm GFX 50R, with the 110mm f/2 lens. 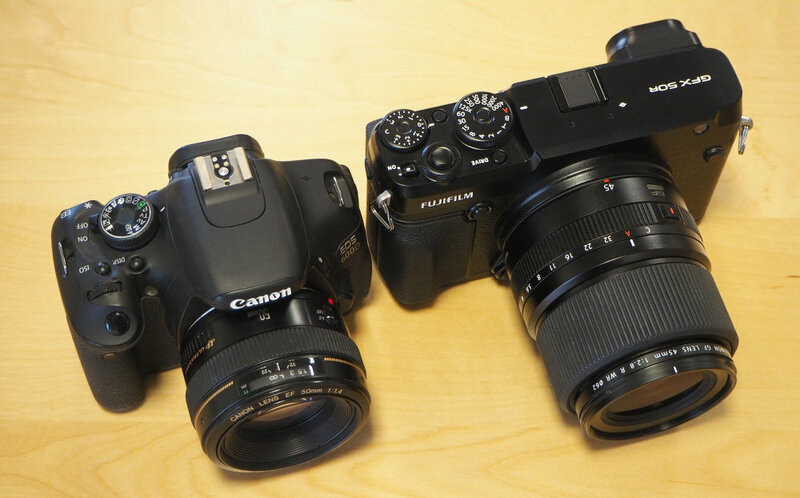 Here's a picture of the GFX 50R next to the entry-level Canon EOS 600D (APS-C) DSLR, with the 50mm f/1.4 (full-frame) lens, just as a size reference. Canon EOS 600D Next To Fujifilm GFX 50R. When we look at what the GFX 50R is up against, the Hasselblad X1D is lighter and similar in some measurements. A mirrorless medium format camera gives you a much smaller camera compact to medium format DSLRs, as you can see in the following table. Compared to a full-frame DSLR, such as the Nikon D850 you're looking at a weight saving (in body only, ignoring the lens), of around 225g, as the Nikon D850 weighs 1005g, and you're also looking at a smaller camera body, as the D850 measures 146 x 124 x 78.5mm (1421cm3). 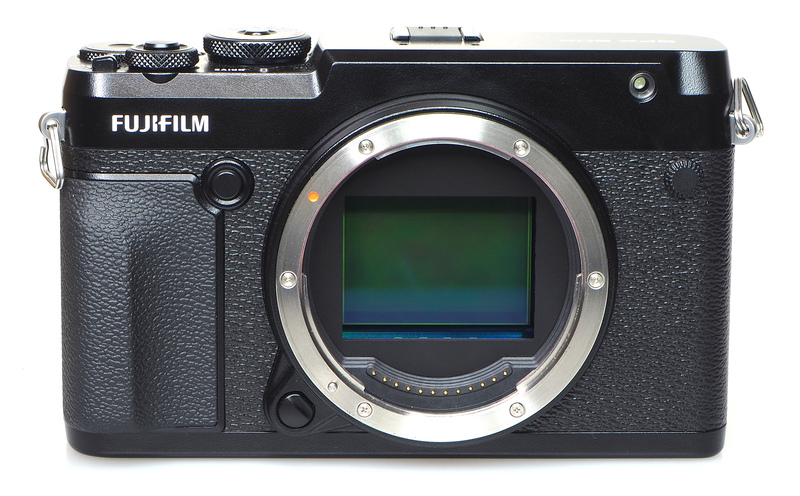 Fujifilm has produced a smaller, lighter camera body than a full-frame DSLR camera. The camera gives direct control over aperture and shutter speeds, or you can set these to A (for Auto). You can use exposure compensation. The front dial is used to change the ISO speed, however, the dial and button setup can be customised. The 3.2inch touch-screen on the back can tilt up, and down. The screen has a high resolution of 2.36m dots. Swiping the touch screen lets you access additional settings, and these can also be customised or switched off. You can use the touch-screen to set the focus point, adjust Q-menu settings, but you can't use the touch-screen to change menu options. 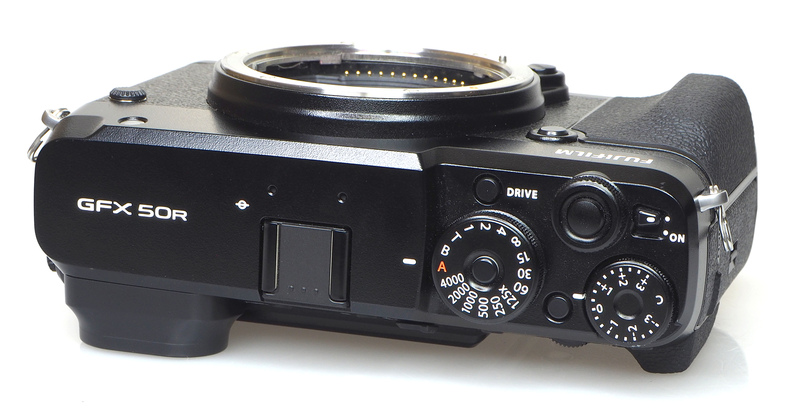 The drive button lets you switch between the drive modes, including single, continuous, AE / ISO / Film simulation / WB / Dynamic Range / Focus bracketing, multiple exposure, as well as the video recording mode. 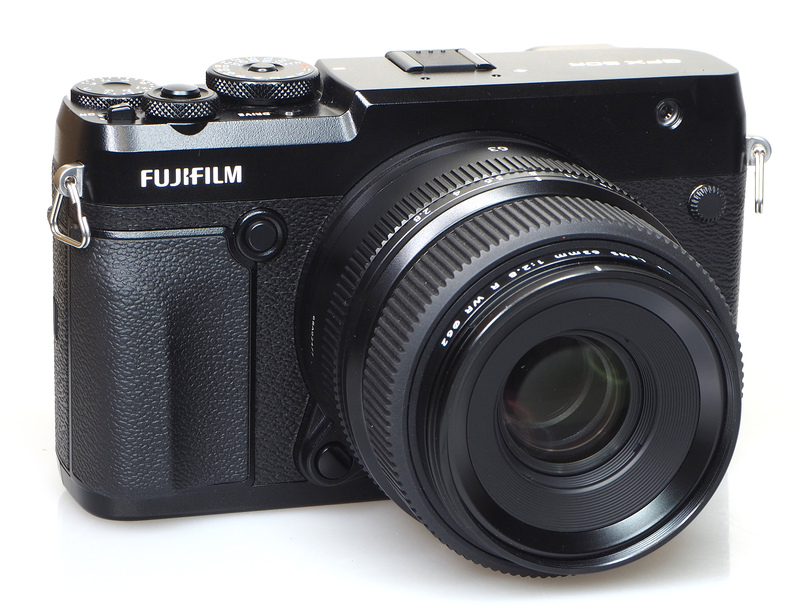 There's a range of G Mount lenses available, and Fujifilm regularly announce new lenses. There's even 3rd party (manual focus) lenses available from Laowa., and Mitakon Zhongyi. You can use an H to G adapter to use other medium format H mount lenses as well. Fujfilm film simulations are available, with all your favourites available including Provia/standard, Velvia/vivid, Astia/soft, Classic Chrome, Pro Neg Hi, Pro Neg Standard, Acros (Monochrome), Monochrome, and Sepia. The Acros and Monochrome modes give the option of a Yellow, Green or Red filter. Grain effect and colour chrome effect are also available (with weak or strong settings available). Wi-Fi and Bluetooth are built-in-letting you remotely control the camera from your smartphone, as well as transfer images via Bluetooth, for improved battery performance. (Bluetooth uses less battery than Wi-Fi). FullHD 1080p video recording uses the full width of the sensor, cropping to 16:9 aspect ratio. There are options for 29.97P, 25p, 24p and 23.98p. Stereo microphones are built-in, and there's a 2.5mm microphone socket / remote socket. 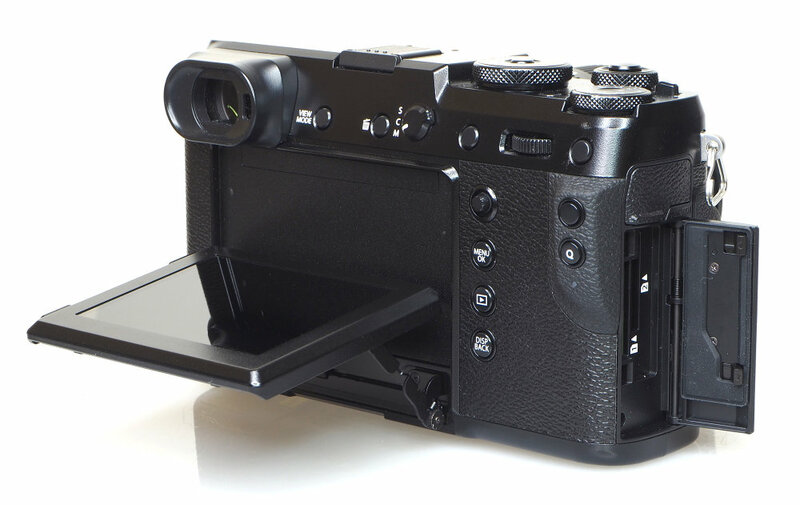 The camera feels extremely solid, and with a magnesium alloy construction, it should survive many years of use. The camera is weather-sealed to make it weather and dust resistant, making it suitable for outdoor use in less than ideal conditions. 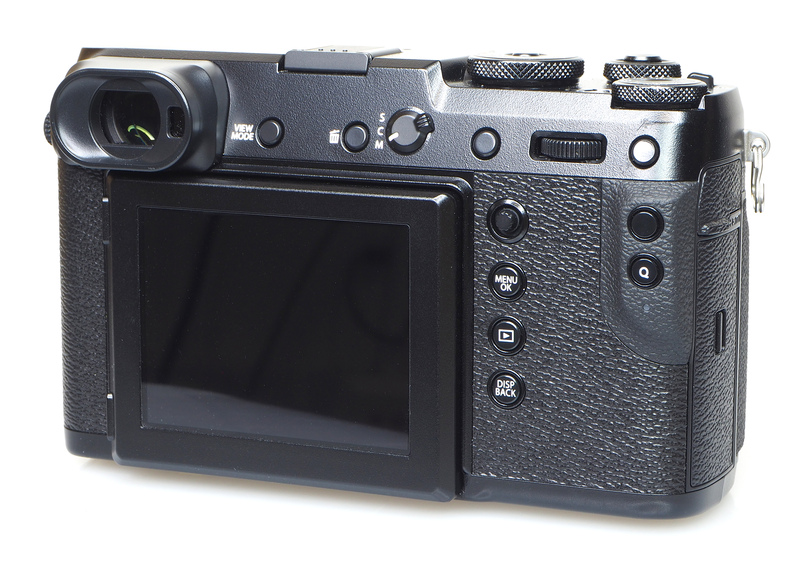 The front grip could be considered as being a little small, and perhaps not as deep as you would like, considering the weight and size of the camera, and an extra millimetre or two wouldn't go amiss, although it's understandable, considering the design aim or providing a more compact rangefinder style camera. The rear thumb grip provides a reasonably large protrusion for your thumb. There's no optional battery grip available, so if you were hoping to extend the battery life, I'm afraid you're out of luck, and you'd be better off looking at the GFX 50S. Controls / Ergonomics - There are numerous external function buttons that can be customised. They are unlabelled, and to begin with, this can be a little confusing, as it will take you time to get used to what each button is used for. However, it's a great idea in terms of letting you customise what each button is for, and once you've got the camera set up how you like it, it becomes easy to remember what each button is for. The top shutter speed dial can be locked/unlocked. The aperture control on the lens can be set to A (auto) or C (custom) and this then lets you control the aperture from the camera body. The electronic viewfinder (EVF) offers a high resolution of 3.69m dots and eye-detection. The edge of the eye-surround is made from a tough rubber, with some flex, but not much. This is most likely to give the surround extra durability as it is quite exposed on the corner of the camera. However, it doesn't look great, and the main surround is made of black plastic. On the side is the dioptre correction, and this is pulled out to change, pushing it back in locks it in place. The screen tilts up and down and for most situations, this provides ample flexibility, however, if you want more, then the GFX 50S can tilt 3-ways. The screen looks great, with a high-resolution, and the only time it doesn't look good, is when you've covered it with fingerprints, from using the touch screen, or from your nose touching the screen (if you use the EVF with your left eye). You can use the touch-screen to set the focus point and adjust Q-menu settings. The memory card compartment features two SD card slots, and there is ample rubber sealing, as well as two latches to lock the cover in place. There are 117 / 425 focus points, and there are wide AF-S and tracking AF-C options. Menus – The menus follow the same design and layout as other Fujifilm X series cameras, with everything neatly organised into sections. There's a MyMenu section so that you can keep your favourite settings for quicker access. Unfortunately, you can't use the touch-screen to change menu options or to scroll through the menus. There's built-in raw conversion, letting you adjust settings, and produce a JPEG image from the raw photo, however the changes you make to the image aren't shown while you change settings, but instead you have to wait until you've created or saved the JPEG image, and then you can view the changes. It would be nice if a quick preview of changes was shown while making changes. 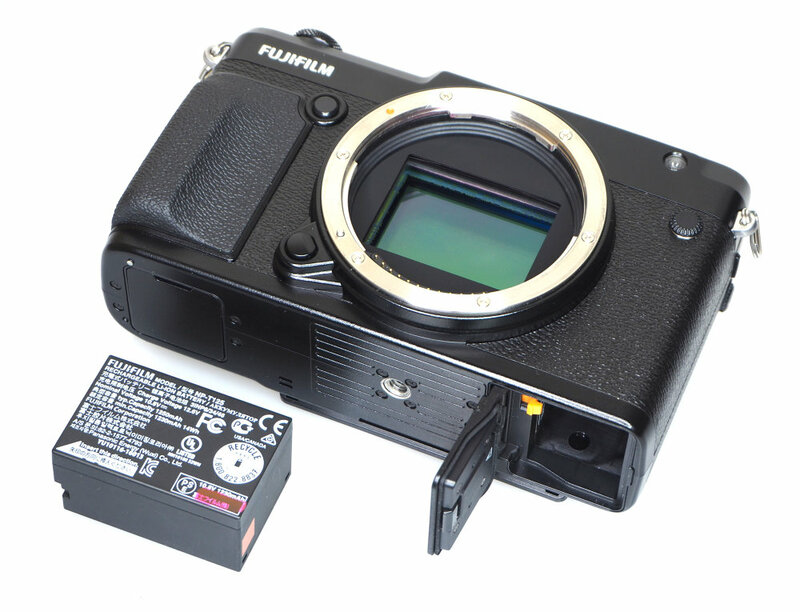 Battery life - Battery life is rated at 400 shots according to Fujifilm / CIPA test results, which is the same as the GFX-50S. We'd recommend a spare battery just in case. Underneath the camera is where you'll find the battery compartment (with rubber seal), as well as a second flap which covers the USB Type C connection, and a DC in socket. This may be an area where you want to show extra care, as regular use of this cover may see it bend or stretch making it more difficult to fit entirely flush with the camera (as in our example).